My first "acquisition" since I found out about insulator collecting. Collectors call this piece a CD 121. Hi, I'm Deb. 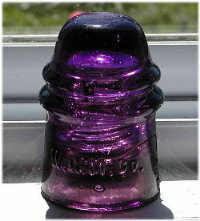 Welcome to my Insulator Collector's page! I live in Southern California on the West Coast of the USA, having recently moved from the opposite side of the country. I am fairly new to this hobby, having only discovered that it exists on March 28, 2002. While searching for information on the web about a completely different topic, I followed a link to a page about COLLECTING INSULATORS. I was amazed. I had no idea anybody collected these things. My parents and my grandmother have always had a few of them, mostly porcelain pieces, sitting in the garden. 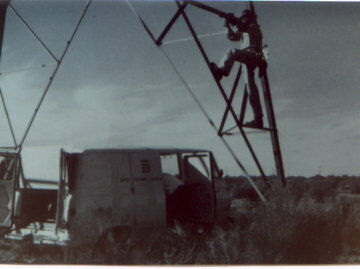 My grandfather brought them home while working with the Southern California Edison Company. I always found them attractive and interesting, but didn't realize anyone else would feel the same way. 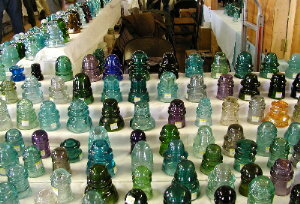 A dizzying array of insulators for sale at a show in Maryland. Inspired by that website, I began researching the hobby. I quickly realized that they made a lot of beautiful pieces and stuck them on the top of poles! I wanted some for myself. Colorful glass decorates my kitchen window. Can you believe these beauties were used to hold wires off of poles? My grandfather, Charles J. Walton, Sr., meggers the lines for trouble. U-172 "Haystack" picked by my grandfather. 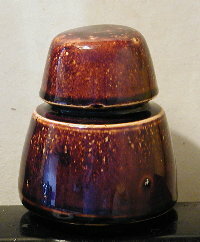 This is a cool piece with a neat glaze, plus lots of sentimental value. I dedicate this site to my grandfather, Charles J. Walton, Sr. He worked the lines for 45 hard years. 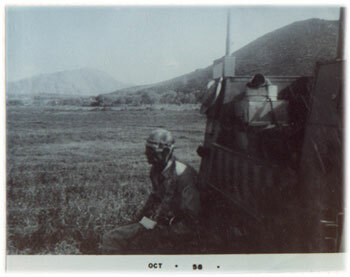 taking a break on the back of his SCE truck (October, 1958). for Dogs Dogs & Cats - Endangered Species? Coming soon---more active sections, including additional photos of my insulator collection.